Flocks of white-cheeked pintail ducks, and West Indian whistling ducks at Armstrong Pond on Middle Caicos. Armstrong Pond is a remote and natural saline pond in the centre of Middle Caicos. The pond is a unique and efficient natural sea salt accumulator, as well as being a haven for birdlife. With a collective area of about 92 acres (37 hectares), Armstrong Pond is one of the larger completely landlocked bodies of water in the Turks and Caicos, yet many of the inland lagoons and pond in the country with clear ocean connections are far more extensive, such as Chalk Sound and Juba Sound on Providenciales, and Big Pond on Middle Caicos. 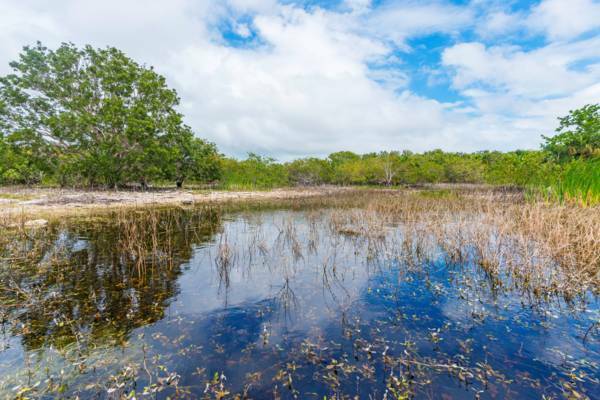 The terrain near Armstrong Pond is quite scenic, and combines elements of saline wetlands, tropical dry forest, and brackish water wetlands. Armstrong Pond itself has widely varying salinity levels, which ranges from fresher than ocean water conditions after hurricane and storm surges, and heavy rain events, to times when much of the pond is crystalized salt or brine. Although Armstrong Pond is a saline body of water, many small fresh and brackish water pond surround the area. These oasis features are quite beautiful, with tall sabal palms, West Indian mahogany trees, sawgrass, ferns, and aquatic plants. Armstrong Pond is a haven for birdlife, particularly wading birds and ducks, including White-cheeked pintail ducks, and West Indian whistling ducks. Mahogany tree oasis on the ancient Lucayan road to Armstrong Pond. The Turks and Caicos has had an interesting and varied history with sea salt, and Armstrong Pond was likely one of the birth places of the industry in the archipelago, and an initial gathering point for the commodity by humans. Prior to the arrival of Christopher Columbus in the latter 1400s, the Turks and Caicos was populated by the Lucayan peoples (also known as the Tainos). And it’s believed that these peoples were skilled and efficient traders. Many of the islands in the country still exhibit slight evidence of these peoples, even after more than five centuries. Artefacts examined today suggest that the Lucayans conducted regional trade, and salt may have been the catalyst for permanent settlement in these islands. In previous times, salt was much harder to come by and was very valuable. The saline flats in the islands were essentially gold mines, and the local inhabitants were probably able to trade salt for everything from hardwood canoes, to stone tools and honey. Middle Caicos appears to have supported the greatest population of Lucayans of the islands in the country, and the village sites in the central region of the island suggest the greatest wealth, power and significance. Armstrong Pond was likely one of the best salt gathering locations in the archipelago, yet Lucayan settlement remains have been discovered near other natural salt pans as well. As a testament to the importance of the salt trade and Armstrong Pond, an impressive road, the most significant Lucayan engineering work recognized today in the islands, was built to connect the pond to a trade settlement. Fresh water pond near Armstrong Pond. Armstrong Pond is one of the more remote areas in the Turks and Caicos, and is quite difficult to access. 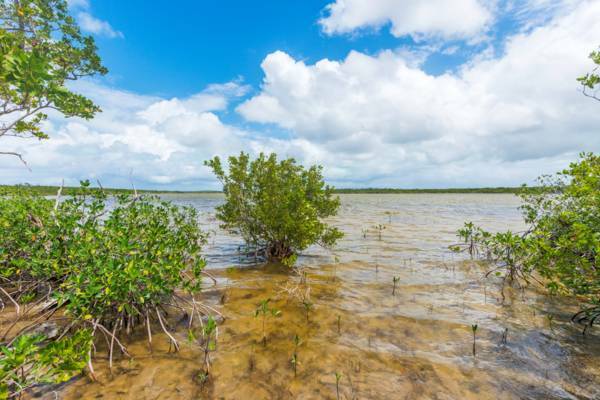 The region is isolated from the Bambarra settlement on Middle Caicos by miles of dense tropical dry forest, and from the Caicos Banks by an equal distance of maze-like red mangrove estuaries. 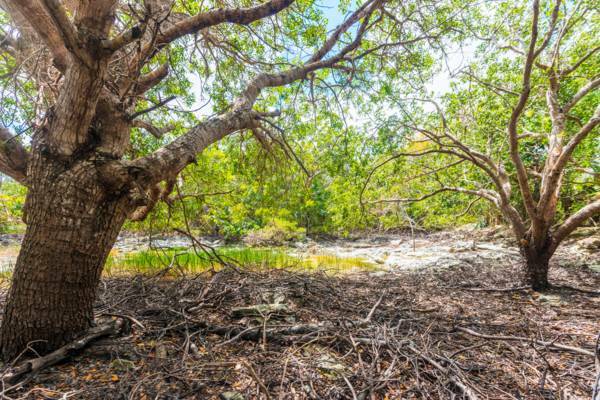 In the past, a footpath led from King’s Road in central Middle Caicos to Armstrong Pond, yet this route has long since been overgrown by verdant vegetation, and is now more difficult to transverse than the original forest was. It’s easiest to hike in from the southern saline tundra on the southern side of Middle Caicos, which usually dictates an overnight camping trip to allow sufficient time. The tropical dry forest surrounding Armstrong Pond has a very high density of two types of poisonous trees, the coral sumac (Metopium toxiferum), and the manchineel (Hippomane mancinella). Both of these trees can cause serious rashes and skin conditions when touched, and should be avoided. Another consideration when visiting the southern sides of North Caicos and Middle Caicos are mosquitoes. For much of the year, the mosquito situation is quite severe, and during the wet season it’s advisable to wear long sleeves, gloves, and mosquito netting.